This award was created by Team Etsy Malaysia to promote, and hopefully, build a network of creative Malaysian bloggers around the world. 2. List your 5 sources of inspiration. 3. 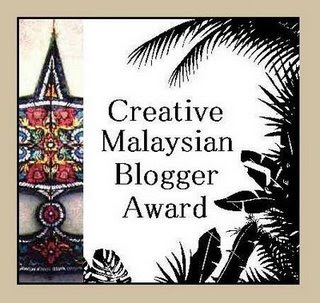 Nominate 5 other Malaysian blogs which demonstrate some form of creativity. 4. Be sure to link to your nominees within your post. 5. Let them know that they have received this award by commenting on their blog, and if possible, make sure they follow these 6 steps too! 6. Share the love and link to the person from whom you received your award. i saw my name on it.